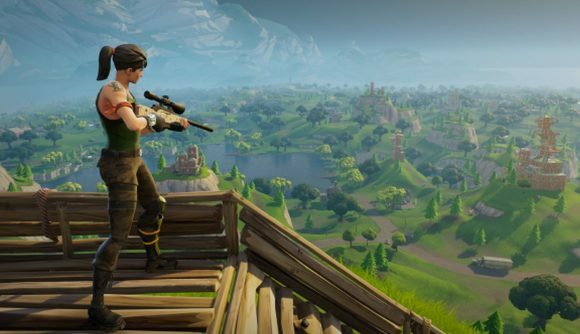 New weapons are (always) on their way to Fortnite, and a potential new addition looks like it could have a massive impact on the game. Dataminers StormShieldOne have uncovered a legendary high calibre sniper that should be on its way to the game in next week’s update. The Heavy Sniper Rifle, as the weapon seems to be called, is a “powerful and accurate rifle with a bolt-action mechanism with an extremely slow reload.” That’s relatively similar to the bolt-action sniper rifle that currently exists in the game, but the heavy sniper has a trick up its sleeve, allowing it to smash through enemy defenses. According to StormShieldOne, shots fired from the Heavy Sniper “pierce through the first wall [they] hit.” That firepower is backed up by some significant damage – the heavy sniper deals 157 damage on-hit, which is an awful lot more than any of the other snipers in the game. It’s also almost the exact opposite of the Crossbow (which has been consigned to the Vault), which couldn’t do any damage to structures. The introduction of piercing shots could have quite the impact on both the early and late game. A significant advantage of the wood resource is that it’s abundant, easy to gather, and gets up to its full strength faster than brick or metal. However, you can see through the gaps in the wood, potentially allowing eagle-eyed enemy players to know where you are in your tower. Usually, that doesn’t matter, as their bullets will be stopped by your defenses. But if players equipped with the heavy sniper now know that they can get a shot away through those barriers, wood could become significantly less popular in the late-game – brick and metal might be rarer, but you can’t see through them once they’re fully formed. You can check out the item in the tweet above, courtesy of TwoEpicBuddies. The new item should arrive early next week as part of a new update, but it may be pushed into a later update. Check out our Fortnite tips guide if you need a hand securing that Victory Royale, but be aware that even we can’t help you against a sniper that can get you through a wall.